Harbor (2), 2008, oil on canvas, 60 x 70". Scenes of the apocalypse and disasters both natural and man-made could now be considered New York–based artist Joy Garnett’s signature subjects, yet they retain their capacity to frighten. In her latest works, which once again incongruously deploy sumptuously applied paint to render open-source images culled from the Internet, the artist depicts vistas from around the world taken at ostensibly the same moment. Although they verge on abstraction, the canvases provoke memories by drawing on the lingua franca of documentary news photographs. Garnett’s talent is for simultaneously imbuing these sublime landscapes with a hushed vastness that nearly nullifies their perilous circumstances. The smog-filled serenity of the sun rising over a densely packed city and undulating horizon in Morning in China, 2007, is suffused with anticipation. Here Garnett’s loose, impressionistic brushwork and colorful palette underscore the pace of China’s rapid transformations, whether positive or negativeincreasing population, burgeoning economic force, looming environmental concerns. 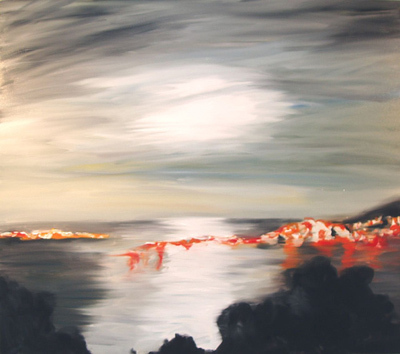 This sense of bated breath gives way to trepidation in the twilight ambience of Harbor (2), 2008, in which a blaze of red paint seems to stretch from the land out into the water, signaling danger in an otherwise romantic seaside landscape reminiscent of Karen Kilimnik’s paintings. Though Garnett’s new work may seem like a departure from her more recent themes of “strange weather” and global warming, perhaps these landscapes should be considered through another definition of weatheras an inquiry into how long we can withstand our current conditions. Right now, they seem like a forecast of things to come.